So… I love me some yard sales. Around these parts we also call ’em garage sales. As you may already know, I adore finding a great piece of junk that can be turned into the best version of itself, or re-purposed into some other awesome, better or more modern thing. I live in an area where, in summertime, Saturdays are synonymous with yard sales. I love this, since they’re fertile ground for New Projects. But beware: Yard Sale-ing is not for the faint of heart. You’ve got to get up early and really hit the pavement to find tip-top junk. Some sales are duds. Some are a waste of time as far as New Projects go. C’est la vie! Most of the time I end up finding like-new toys for my little girl, and that’s pretty darn awesome too. 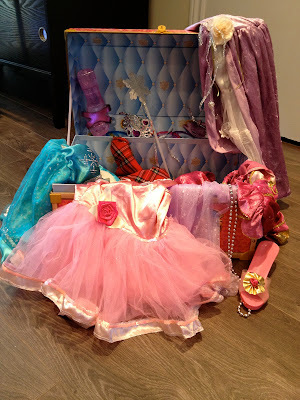 If it weren’t for the amazing deals we’ve found on kids’ stuff (sometimes still in its packaging! ), my little one would spend her days playing with a lost sock and a broken stick. 1. Must have nice lines and a good shape. Bonus points for something very unique and so beautiful that you’ll be happy looking at for years to come. Look for good dimensions and balanced proportions. You can paint something a prettier color but a badly-made piece will still be ugly, just different. 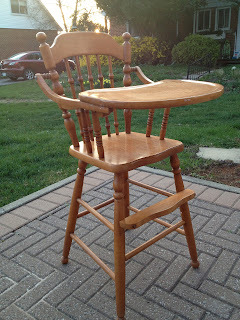 Good call: this adorable high chair will look so cute in a fun color. 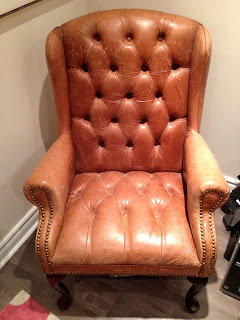 Cool beat up leather wingback, with nailhead trim. Pro: solid as a rock. Con: covered in cat scratches. Can it be fixed? We shall see. This tray is really not cute. But it’s beautifully made and reeks of potential. 2. Must be sturdy (or be very, very easy to fix). How we learned this lesson: I once picked up a set of 6 dining chairs that I planned to reupholster, and fix the torn/broken caning in the backs of 3 of them. 6 cane-back dining chairs = buyer’s remorse. Wait – did you say fix the caning? To do that, I’d either have to study for years under the tutelage of a master caning artisan, or pay one a lot of dough to do it for me. It was hopeless, as my vote was for neither. After many months stacked in the garage eating up valuable junk real-estate, I finally passed those chairs on to another well-deserving treasure hunter who picked them up in the night. Hey, as long as they don’t end up in a landfill, I’m a happy camper. 3. Must smell good – no mildewed or stinky anything. It takes a brave soul to stick your nose into a piece of furniture sitting in someone’s driveway (with them watching you do it), but believe me you’ll be sorry you didn’t if you bring home a stinker. Stay away from the tell-tale black powdery looking stuff, a sure sign of mildew. Often found on baskets (what a shame!) but can be on just about anything. Smells to avoid: rot/dank/stink from being in a damp basement, shed or garage for too long; cigarette smoke (especially if the thing is upholstered); cat pee; and mothballs. Nothing more needs to be said about mothballs, they’re just awful (not to mention known carcinogens). Ain’t too pretty now, but all redone this will be perfect for toy storage. And no stink! 4. Must have an immediate purpose. 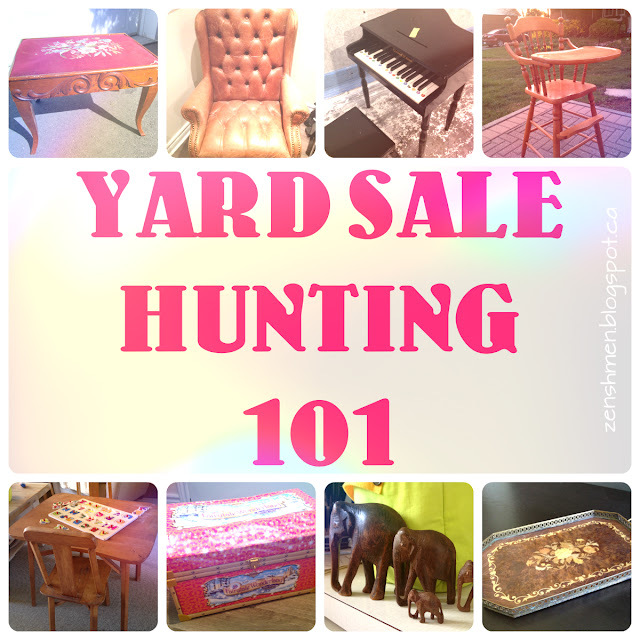 Take it from a gal who has a basement and garage full of pieces waiting to find a home. If you don’t immediately know who can use it and for what precise purpose, take a pass. Pounced on some old thing because it was cheap and you might one day suddenly feel inspired to work on it? Boy’s clothes because you might one day have a baby boy? Cookie tins because you might someday take up baking? Guilty, guilty, guilty. And now my mission in life is to get rid of these things. Bad call: This old bench is pretty cool but 100% the wrong size for our needs. My tiki-hut moment. Thought they could be cute with new round seat cushions. Not gonna happen. 5. Must be a great price. But when I saw a cute-yet-broken table that I considered for a brief moment in time, I thought hey, I’d pay 5 bucks for that. Then I noticed a sticker saying $95 (!!) and recoiled. What was this lady thinking? It’s not like it was a fancy antique. It was just a crappy old (did I mention broken?) table. Ohh, I can see this now. Cute fabric, cushy seat, a fun color. The detail is beautiful. – No stuffed animals. Not since I saw that episode of House where a deadly virus was transmitted throughout the hospital on a stuffed animal. No sir. – No broken stuff, or any games with missing pieces. – No huge hulking plastic playthings that are impossible to put away, and thus permanently on display. – Must be clean-able. If it can’t go in the washing machine/dishwasher, or be sprayed down, forget it. – If it requires batteries: a) it’s in perfect working order or b) if the battery compartment is empty, no battery acid has leaked, it’s perfectly clean, and the owner has confirmed the thing works. – Bonus points for something educational/ teaches any kind of skill. – Bonus points for tickle-trunk finds leading to silliness and imaginative fun, like dress-up clothes, costumes, funny oversize glasses and silly hats (but all must be washable). Fully functional wooden baby grand + bench, with a print-out from Amazon stating its worth of $160. Nabbed it for $20. 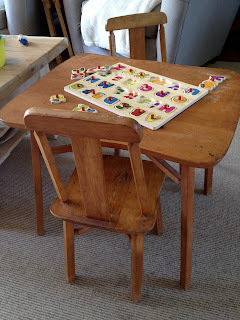 Adorable and solidly-built table and chairs for $10. Can’t wait to give it a shot of great color. Credit where credit is due: my Mom is a champion garage sale hunter and nabbed this trunk-full of dress-up clothes for $5. What about you? Do you brake for garage sales? What kinds of things do you look for? And what kinds of treasures have you found? Love the advice! As someone sensitive to noise, I would add that any toys that make a loud and or annoying sound don't make the cut either!